When you are faced with a wall of snow in your driveway, or even just light layer of dust or ice, you need to break out the best snow shovel you have and get to work. But shoveling the white stuff is not something everybody likes to do and making it as easy and painless as possible is what you are after so getting just the right tool for the job is imperative. We take a look at the ones there are on the market in the way of snow shovels to give you a greater understanding of how they work and what type you should be looking for. View the Best Snow Shovel on the Market, Below. What is the Top Snow Shovel? How to use a Snow Shovel? What to look for in a Snow Shovel? Top rated snow shovel for driveway? We look at things like their weight, ease of use, shape of the handle, the material and construction of the products as well as the blade of the show pusher tools on offer. All of these aspects will determine their suitability to your needs. Whether you are looking for a pusher or snow shovel, we have something on our list that will lighten your load when it comes to clean up time.Looking for something more powerful? Check out our review on the top snow blowers. This is one of the best products from Garant that will ensure that the task of clearing your driveway after a snowfall is not hard work. Offering high-quality construction coupled with a great, ergonomic design this shovel will have your driveway, sidewalk or stairs clear of the white stuff in no time at all. The blade of these products are 30 inches or 76.2cm and it is constructed of reinforced steel to give you the strength and rigidity needed to be able to dispense with large amounts of the white stuff quickly and easily. This is a one-piece construction which makes it extremely strong and durable. Moving large amounts of the white stuff with a shovel can be back-breaking work, but with the best shovel such as the Garant, you can simply push away the dusting without the heavy lifting of shoveling. This pusher has a D-grip handle constructed of varnished hardwood that is specifically designed to absorb the shock as you move the white powder, protecting your body from unnecessary stresses. The handle of the Garant is wide enough to accommodate gloved hands and is very comfortable to use under any conditions. See more information on Garant YSP30DU. Need to move a lot of it but don’t like the heavy lifting associated with shoveling, then the Garant YSP30DU is the tool you need. It is a pusher with a 30” reinforced steel single piece constructed blade, beautiful and durable varnished hardwood D-grip handle and can accommodate gloved hands. Winter is a blessing and the snowfalls that come can be beautiful, except when they are blocking your driveway, deck or sidewalk. Moving it out can be a very arduous task that many people do not look forward to, but with the one of the best snowplows, you can get the job done quickly, efficiently and without the stress and strains that normal shoveling would put on your back. It is designed to adjust the shoveling angle to 45 degrees bi-laterally making it easier to remove the white dust quickly and the T-shaped handle is also adjustable to limit the amount of bending you need to do. The handle adjusts from 6.9 inches to 40.9 inches or 17.5cm and 104cm. Pushing your snowplow is no problem with the two extra-large wheels that are standard on the Ohuhu to enable you to push it away even on slippery or uneven surfaces. Assembly of the snowplow is done in mere minutes and it is collapsible to make for easy storage when not needed. The orange paint overcoat on the full metal plower gives the heavy duty tool a beautiful finish and also adds to its durability. See more information on Ohuhu Adjustable. One of the best and easiest to use snowplows that offers easy assembly, compact storage, and features that enable you to clear your driveway or sidewalk with minimal effort. Large wheels adjustable blade and handles and superb finish all add up to a great shovel to meet all your winter needs. Lightweight, easily portable shovel is what you need when you live in a climate where inclement weather can strike at any time. Having a shovel when out hiking, driving in your car, SUV or on your snowmobile, or enjoying a fun-filled holiday in a wintery landscape is essential. The AAA 4004 weighs in at a mere 1.3 pounds and the handle is adjustable from 25” to 32” to accommodate everybody. It is a versatile lightweight product that is durable and strong and can disassemble into three pieces for easy portability no matter where you are or what you are doing. The frame is constructed from high-quality aluminum making it light enough to fit into your backpack for those snowy hikes. The AAA is very easy to assemble and comes in three bright colors to make it easy for you to identify them in any conditions. When traveling with your family or alone during the winter months you need to have a reliable, lightweight and easy to use shovel available and the AAA 4004 meets these needs superbly. See more information on AAA 4004. Lightweight, easy to assemble, compact three-piece construction to make it perfect for cars, SUV's and snowmobiles, the AAA 4004 comes in three bright colors to make visible even in the worst conditions. Adjustable handle and sturdy aluminum construction and a great price make this one of the best on the market this winter. When you need to move it out of your driveway quickly and efficiently with minimal effort you need a great shovel. The Suncast SF1850 offers you great features and a sturdy construction to help you cope with what winter may throw at you. The 22-inch scoop shovel is designed to enable you to collect large amounts of the stuff with each scoop, and the non-stick graphite blade means that you do not have to struggle with clumps left over in the scoop when trying to empty it after each thrust. The handle is adjustable and collapsible allowing for easy storage, its extended height is 60cm which is perfect to help prevent back aches as you can stand upright when shoveling. The durable single piece steel construction of the shovel means it will last for many winters and is easy to store away during those nice summer months. Best for clearing your driveway, sidewalk or steps. See more information on Suncast SF1850. The perfect tool for clearing your driveway or sidewalk during the snowy winter months. The collapsible handle and study one-piece steel construction make it both durable and easy to store away when not needed. The non-stick graphite blade and 22-inch scoop make light work of clearing the white stuff away. Shoveling white dust is not everybody's favorite task and having a tool that can make this as easy and quick as possible is what you are looking for. The Snow Joe provides you with an 18-inch blade that is constructed from heavy-duty aluminum with an ergonomic D-ring handle grip that ensures your comfort when performing your driveway clearing duties. Shoveling snow can take a toll on your back but with the Joe, the blade acts as a fulcrum which in turn reduces the strain on your back and legs. The handle of the shovel helps to reduce the need to bend and improves your posture when lifting heavy deposits, employing your upper body strength rather than your lower body and back muscles. An intuitive design offers a spring assisted handle which is both non-rigid and flexible. This acts as a shock absorber when shoveling and the energy that is created with each throw is sent back into the shovel to help you get through your task quicker. See more information on Snow Joe SJ-SHLV01. The intuitive design of the Joe helps you to not only clear away your driveway quickly and efficiently it also helps prevent back and leg strain. With a spring-loaded handle what absorbs the shock and is energy efficient, an 18-inch blade of aluminum construction it is both lightweight and durable. A combination shovel and pusher this is the ultimate tool for clearing your driveway, sidewalk or stairs of that pesky white stuff in winter. It is designed with an ergonomic aluminum handle which will help to reduce the stress on your arms and legs when pushing or shoveling. The large D-grip handle takes into consideration that you will be wearing gloves when shoveling and is very easy to hold and grip in any conditions. The blade of the True Temper is 20-inches making it the perfect size for your home use and features a nylon wear strip along the edge, this not only extends the life of the blade but also prevents you from damaging your decks or other surfaces when pushing or shoveling it away. The blade itself is a world first as a combination aluminum blade. 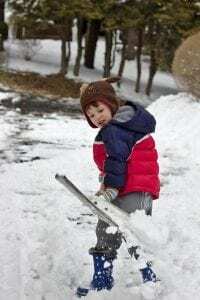 Having a tool that can both shovel or push is great as it negates the need for two separate tools when faced with different conditions, and clearing your driveway just became a task that is not so dreaded in winter. See more information on True Temper 20-Inch Ergonomic. The best combination blade saves you time and money and this shovel/pusher offers you a D-grip handle that is wide to accommodate gloved hands, a nylon wear strip along the edge to help prevent damage to surfaces and an 20-inch blade to take care of all your white dust troubles. One of the best, most practical, comfortable and designed to allow you to either shovel or push your worries away the Suncast SC2700 is one of the best on the market this winter. Featuring a dual action black non-stick graphite blade this pusher or shovel will not allow any clumps to remain on your blade when clearing out the driveway. The galvanized steel wear strip that is situated on the outer edge of the blade adds to the durability of the product preventing damage when clearing out your driveway, from stones or grit. Comfort is a feature of this product with a comfort grip that is added to the handle of the shovel and a steel core for a solid and sturdy feel when shoveling or pushing it away. The shovel measures 51 inches to help prevent too much unnecessary bending and the blade itself is 20 inches wide to help clear the white stuff away quickly and efficiently. See more information on Suncast SC2700. Sturdy, well designed and feature packed this combination shovel/pusher will help you make light work of clearing it out from your driveway or sidewalk. 20 inches of blade with a galvanized steel wear strip on the edges make is very durable and the comfort grip on the handle ensures ease of use. Another superb combination pusher/shovel from Suncast the SN1000 has all the features and more to help you get rid of that snow on your driveway, deck or sidewalk. The angled rib patterned blade which is 18 by 13 inches in design will remove it quickly and efficiently from driveways, sidewalks or decks in the snowy winter months. The comfortable ergonomic handle offers a great grip with a wide ribbed steel core D-handle to allow you to shovel or push it away effortlessly. The length of the shovel is 48 inches overall, this helps to prevent bending and relieves stress on your back and arms. The S-handle on the pusher helps you to reduce stress even more when pushing it away. Poly-coated it is ultra-durable and very easy to use. Compact it is designed to be stored away easily and can be used when traveling too. See more information on Suncast SN1000. This is definitely one of the best combination pusher/shovel on the market with an ergonomic design to reduce stress, a wide ribbed steel core D-handle for ease of use and a poly-coated finish for optimal durability, it is one of the best on the market this winter. Removing snow from your wooden deck is never easy and some of the shovels on the market can actually damage your wood surfaces when pushing or shoveling, not so the Snowplow 50548 with its UHMW polyethylene blade that will not gouge out your wooden surfaces. A lightweight shovel that is easy to use it has a non-abrasive, impact resistant blade which is safe to use even on your sensitive areas around your home, and a D-style control grip to enable you to work accurately and comfortably when shoveling that unwanted snow off your driveway, sidewalk or wooden deck. Push, scrape or chop with these great products to get the job done. The reinforced fiberglass 48-inch handle makes it easy to use and very durable. The rust-proof construction adds to the durability and it comes with a handy wall hanger to enable you to store it away neatly when not needed. See more information on The Snowplow 50548. Clearing your deck from snow is a breeze with the Snowplow 50548 shovels with its UHMW polyethylene blade to prevent damage to sensitive wooden surfaces, 49 inches reinforced fiberglass handle with a D-style control grip and a lightweight durable construction you will not have to struggle with snowfalls this winter. A 100% made in the USA product that offers you all the features you need to get rid of that heavy or light snowfall from your driveway or sidewalk. It is a commercial grade snow pusher which will efficiently and quickly clear out any unwanted snow and its great design will limit the amount of stress you put on your lower back when doing the job. The fiberglass construction of the handle is high-quality and provides not only the durability you are looking for but also the strength you need to get rid of heavy snow. The reinforced poly head and D-grip which is wide enough to allow you to use it with gloved hands are great features. The 22-inch poly scoop on the snow pusher allows you to effectively push away the snow quickly and powerfully with long handle design to give you maximum leverage. Durable and lightweight this is a great tool to have at your disposal in winter. See more information on Bully Tools 92814. This is a durable, comfortable to use, commercial grade show pusher that is designed with a long handle for easy clearing of snow and a wide D-grip that will accommodate gloved hands. The reinforced poly head and 22 inches poly scoop make it extremely durable along with the fiberglass handle construction. Perfect for home and car. Living in an area that has high snowfall during the winter months can be a lot of fun, but it also brings with it its fair share of problems. One of these is when your driveway, deck, sidewalk or front door gets snowed in, or you are stuck on the road and need to be able to get yourself out of a snowy predicament the best option is to be prepared for this and that is where the snow pusher comes into its own. The best rated snow shovels or snow pushers will give you the ability to clear away snow quickly and efficiently. They will be designed to ensure that you do not put too much strain on your back, legs or arms when shoveling snow and will be easy to grip even with gloved hands. There are different styles and designs on the market from a general snow pusher to a commercial one that can get rid of large amounts of snow very quickly. You get the snow shovels which are designed to be able to scoop the snow away, the snow pusher where you simply push the snow out of the way or a combination of both of these tools. No matter which one you decide on, having one of them around when you live in snow-prone areas is a must. Choosing the best one is not as simple as it looks and knowing what kind of pusher works best in what kind of environment is one of the greatest advantages, when it comes to selecting the best one for your own requirements. When deciding which is the best one on the market it is important to look at the different categories that you get as well as the construction, material used, durability and more. It will also depend on what you are going to be using your snow shovel for. These types of shovels vary in size, shape and of course overall construction as well as their purpose, either for pushing snow away for shoveling it. Snow is really very heavy, in fact, it can weight from 7 to an incredible 30 pounds per cubic foot and you need a pusher that will be able to handle this kind of weight. If you live in an area that experiences only light snowfall, then the top snow pusher for you would be a lightweight shovel or pusher that is designed to cope with this kind of snow, but if you live in an area that experiences heavy falls, you need something more sturdy and suited to moving large amounts of snow and can handle up to 45 pounds per cubic foot. When selecting the best one for you, it is important to take these things into consideration as well as how easy they are to use and how comfortable they are. Test them out before buying and remember that you will more than likely be using them with gloved hands, so you should test with gloves on. The top snow shovels can be pushers, shovels or a combination of the two types and it depends entirely on your own needs and likes as to which one you would be a best one for you to select. When you are going to be shoveling snow it is important to try to use the best techniques in order to prevent you from hurting yourself or putting excess strain on your muscles and joints as well as you back. There are a few techniques that can be used when you tackle this task. 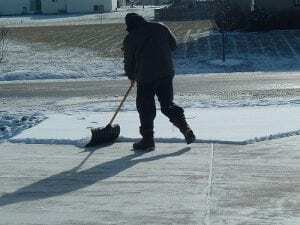 There are times when you are shoveling that you might experience some form of cramping, or you might even pinch a nerve of pulling a muscle in your back. If this happens you could find yourself incapacitated and you have to lie there waiting for help to come and this can happen to you even if you buy the most expensive shovel on the market, it all really comes down to technique. How you are going to be shoveling the snow will depend a lot on the type of snow you will be shoveling. The texture of the snow along with the thickness will all determine how you go about shoveling. For the larger snowfalls, the best would be to use something a little larger, that you can shovel the show quickly moving it out of the areas you need to be cleared. If you are however dealing with sleet or ice, you will need a pusher, this type of a broom with a blade on the end to help you scape away the snow and ice. You also get ones that are a combination of both shovel and pusher and these are some of the best utility products to use when you are dealing with both icy conditions and heavy snowfall. Now that we know what type of pusher you might require, let’s have a look at how to use them. If you are using a shovel to dig out your snow, then you should be sure to protect your back when doing this. Hold the shovel in the correct manner, an overhand grip works very well here as it is easier to throw the snow away once you have it on your shovel blade. Using this technique will help to eliminate the stain you put on your back when shoveling snow. Find out about also protecting your heart while snow shovelling here. When lifting, use your legs and not your back and do not overextend your arms or body when throwing the snow away. Try to distribute the pressure evenly and use your legs and core muscles to do the work. Twisting your body to the side to throw the snow will help to relieve the pressure on your back again. When you are dealing with lighter snowfalls or ice and sleet, it would be best to use the pusher as it is a much more practical way of clearing your driveway. The method is very much like sweeping using a broom. You will place your pusher at the angle you need to get the snow moved to the side that you want. Here you do not have to worry about backaches, bending and in fact requires very little effort besides walking and pushing. There are many snow shovels on the market that fall into the category of the best lightweight ones, however it depends on your circumstances as to which one is actually the best for your purposes. Many of these are designed to be as lightweight as possible. The lighter the shovel, the easier it will be to use and the less strain it will put on your back and other muscles. No matter how lightweight the shovel is though, it needs to have the best ergonomic shovel design in order for it to work effectively. The material that the shovel is made from will also determine its weight. If you need a heavy-duty pusher that has an all metal body, you are going to find that they are not as lightweight as those that have a plastic scoop on the blade and aluminum handles. Bear in mind that having a lightweight snow shovel is best when you are dealing with smaller, less thick snow falls. Shovels, as opposed to pushers, tend to be lighter as pushers need to bear the full weight of the snow as you push it out of your way and tend to be designed with an all metal frame to make them stronger and able to cope with the load. The best lightweight shovels are easy to travel with, compact in design and can usually be separated into parts for easy storage or packing. Selecting the right one for you and the best one is completely dependent on what you want and require from your shovel. Test them out, read reviews online from customers and then select the best one for your requirements. When making a decision on which pusher to select, you need to look for certain characteristics which will be determined by what would be the best kind of snow you need to shovel. If you are going to be clearing your driveway as opposed to digging out your car or the area around your front door, you may consider using a pusher instead of a standard shovel. It will also depend on the amount of snow you need to remove. There are a number of different ones on the market and we will give you a rundown below of what to look for. There are certain key aspects to look out for when making your selection. The material of the blade is important. 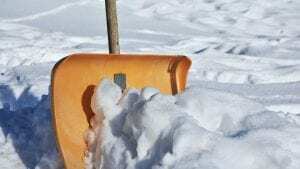 Most of the snow shovels have an all metal construction, however, these are not best when removing snow from your deck or other wooden surfaces. Here you would ideally need something made from strong plastic or at least a blade that has a plastic edge to protect your wooden and other sensitive surfaces. An aluminum scoop is durable and rustproof and will work well when dealing with big drifts of snow. A 24″ option is best for shoveling snow and not pushing it. An 18″ option will reduce the strain on your back when shoveling and a square nosed option is best for scraping or working on icy snow. And the 30-inch option works as both a pusher and scraper as well as being used for shoveling. The weight of your snow shovel will also make a difference. If you are going to be traveling with the pusher or using it for your car, SUV or a recreational vehicle such as a snowmobile you need a lightweight version that is easy to carry and use away from the home, the same will go for hiking. You will also not need a heavyweight pusher or shovel if you are only going to be moving small amounts of snow. If however, you live in areas where you experience large snow falls you may need to consider a more heavyweight option. One that can cope with high volumes of snow on a regular basis and is easy to use. These are usually your all-metal designed snow shovels that are heavy duty and can cope with large quantities of the white stuff. Most of the top rated snow shovels for driveways are those that can push the snow away and not shovel it. The reason for this is that you have a large area to clear of snow and if you are going to be shoveling it could take a long time and take a toll on your body. Being able to push the snow to one side, clearing your driveway of the ice and sleet that sometimes goes along with snow is the ultimate prize. Select a snow shovel with an ergonomic grip on the end to make it easier to hold even when wearing gloves. Snow pushers will reduce the amount of stress on your body, especially when clearing larger areas such as driveways as it does not require the kind of bending and lifting that shoveling does. Choose one that has a long extended handle and even one such as the Ohuhu Adjustable which relieves the strain by adjusting to various heights and where you can angle the blade to remove the snow efficiently. If you live in an area that is prone to heavy snowfall, best you be prepared, that is where some of the best rated snow shovels or snow pushers comes into the equation. Having a shovel that will help you clear out your driveway, sidewalk, deck or steps is essential in winter and getting one that is easy to use, durable and lightweight will make your life a lot easier. The best shovel will make your life a lot easier and are worth the money spent on them. The Garant YSP30DU is out top choice of snow shovels for this winter. It is feature packed and designed to enable you to get the job done as quickly and efficiently as possible. The Garant offers you high-quality construction, this includes a steel reinforcement giving it both rigidity and strength. Shoveling large amounts of snow, or simply pushing it out of the way is a breeze with the Garant YSP30DU. The 30-inch blade on this snow shovel is best for either shoveling or pushing snow and the D-grip handle is not only one of the best looking with a varnished hardwood finish, it is designed to absorb the shock when doing your snow clearing. The blade is a single piece construction which makes it incredibly strong and durable. The handle is designed to accommodate gloved hands and is easy to keep a grip on at all times in any kind of weather conditions. Ohuhu Adjustable is a superb product that is designed with your comfort in mind when performing tasks such as clearing away snowfall from your driveway, deck or sidewalk. The adjustability of this great product is what ensures that you do not put a strain on your back or lower body and allows you to clear away the snow quickly and efficiently. The shovel angle of the Ohuhu is adjustable to 45 degrees bilaterally. But this is not the only adjustable portion of the product, the T-shaped handle also adjusts between 6.9 inches and 40.9 inches, which enables you to remain in an upright position when performing your duties. Moving large amounts of snow with this ATV snow plow is simple with its two extra-large wheels designed to allow you to push the snow away even on uneven or slippery surfaces. It is quick to assemble and it is also collapsible for easy storage. Durability is provided with the orange paint overcoat on the full metal finish, it is both lightweight and heavy-duty so will take care of all of your needs for a long time. All these great features make the Ohuhu Adjustable our premium choice and well worth the money you will spend on it. When you live in a region that is often inundated with snowfall during winter having one of the best rated shovels that is durable, lightweight and easy to use is an essential tool that you cannot go without. The AAA 4004 weighs in at a mere 1.3 pounds making it very lightweight and easy to use, as well as portable so you can take it with you on holiday, in your car, SUV or even on your snowmobile. It has a durable high-quality aluminum construction and it can disassemble into three separate pieces, this makes it easy to store and to travel with. 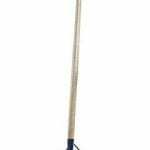 The shovel is adjustable from 25 to 32 inches which makes it extremely versatile. When hiking or doing other outdoor activities in snow-covered landscapes you need to have a snow shovel with you to help you get out of sticky situations and this Sports Utility Shovel is exactly what you need. It comes in three bright colors for you to be able to identify it easily in any weather conditions. One of the best shovels that are one of the sturdiest, lightweight and versatile snow shovels on the market this winter and coming at an extremely reasonable price the AAA 4004 is our best value pick for this winter. We hope you enjoyed our article on "The 10 Best Snow Shovels for the Driveway", if so, please share and rate it.